2 veteran dramas had markedly different swings from their last episodes. NBC: CHRISTMAS AT ROCKEFELLER CENTER was steady with the 2016 edition at 1.7, and that gave SVU a much better lead-in than it’s been getting from THE BLACKLIST. That, along with a heavily-promoted episode, pushed SVU up 0.4 from its last airing 3 weeks ago to 1.5. 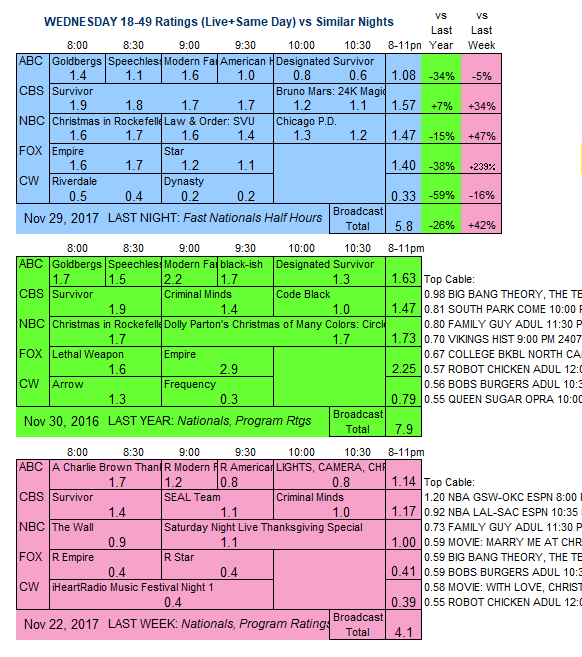 CHICAGO PD was up 0.1 from its last airing 2 weeks ago (when it had THE VOICE as its lead-in) to 1.3. FOX: EMPIRE returned from a week off with a 0.4 drop to 1.6. STAR remained steady at 1.2. ABC: The line-up returned from having Thanksgiving Eve off. THE GOLDBERGS was down 0.1 from 2 weeks ago to 1.4, SPEECHLESS held at 1.1, MODERN FAMILY fell 0.1 to 1.6, AMERICAN HOUSEWIFE lost 0.3 to 1.0, and DESIGNATED SURVIVOR slipped 0.1 to 0.7. 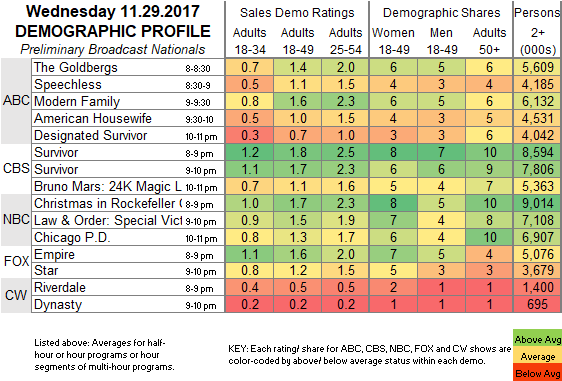 CBS: A 2-hour SURVIVOR at 1.8 was up 0.3 from last week’s hour. The BRUNO MARS: 24K MAGIC LIVE special was at 1.1. CW: RIVERDALE (0.5) and DYNASTY (0.2) were steady with their last airings 2 weeks ago. It’s a holiday special night at ABC, where A CHARLIE BROWN CHRISTMAS is followed by THE WONDERFUL WORLD OF DISNEY MAGICAL HOLIDAY CELEBRATION.